You used the steps described here? This release adds the option to use local repository files, enabling the installation of extensions that are not included in the global repository. Although this features is intended for developers and integrators, tinkerers might find a use for it as well. You can find more information about it on the Development page of the project Wiki. I just wanted to say a big thank you to @Jan_Koudijs and @Astr0b0y. The past couple of days has been a steep learning curve into the world of extensions. What you guys can do blows my mind! As a Mac user, it has been scary experience playing with command windows but the level of detail in your instruction has made it really easy. I now have the Roon tools I need to convert a cassette player into a really cool Roon player. Thanks! My NUC/ROCK Core is connected to Ethernet (192.168.13.0/24) and Wi-Fi (10.3.201.0/24) with both subnets bridged in my network. The Roon Extension Manager service is running an an HP MicroServer that is connected to Ethernet only. I lost the Ethernet connection on the NUC due to a disconnected cable. The locking clip of the RJ45 plug broke off. Roon kept running over Wi-Fi but all my extensions disappeared (except for the RoPieee extension). So bridging of the subnets does not seem to keep the extensions alive. Is your RPi, running RoPieee, connected via WiFi or Ethernet? Did the extensions re-appear after the Ethernet connection was restored? Both RPi’s are connected via Ethernet, but Wi-Fi is enabled. I suppose they are connected on both subnets. But yeah, RoPieee does not disable ethernet when using WiFi. So if you keep the cable connected when WiFi is running as well you get 2 connections. Depending on your infrastructure that indeed might be on 2 different subnets. 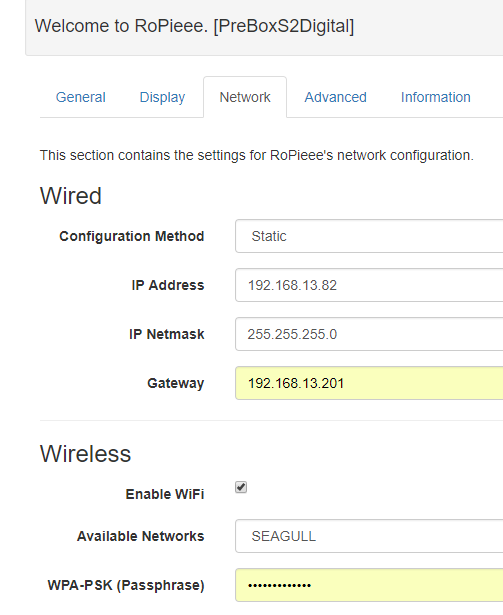 That your RPis have 2 network connections then explains why the RoPieee extension kept the connection to the core. Since the Extension Manager and the other extensions are running on the HP MicroServer with only an Ethernet connection, it makes sense that they lost the connection to the core when the locking clip broke. Anything that can be done here within the extension itself? Related to the 0.7.0 update one might have to re PAIR the manager - at least I had to. I’ve recently replaced my router, updated Windows, and updated Roon, so I’m not sure what the source of the problem is. 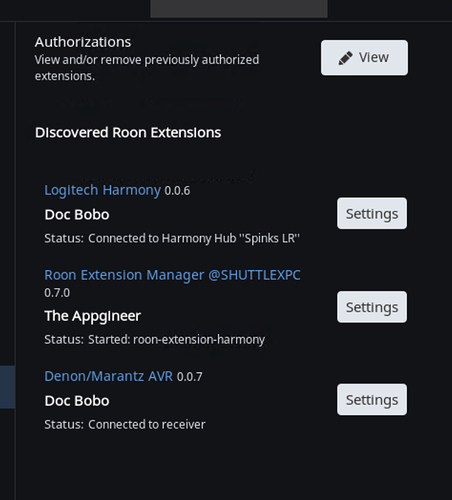 Nothing conclusive in that log, so as a first step you might try to uninstall the Harmony and Denon extension via the Extension Manager and then install them again. Thanks, @Jan_Koudijs. I went ahead and uninstalled all three extensions and re-installed everything. Everything is good so far today. More crashes, even after a clean install of all three extensions. Here’s the log file. Thanks for any suggestions you might have. Did you perform a full uninstall as described here? I didn’t uninstall Node.js and Git, but otherwise, yes. I followed the rest of those steps exactly. Do you run the original Denon extension via the Extension Manager or are you using the fork as discussed in the Denon thread? If you use the fork, how do you run it besides the manager? I quit using the fork back in May, because it seemed a little unstable. I went back to using the standard one in Extension Manager, but TBH I don’t remember exactly what procedure I used to uninstall. The standard one ran great up until recently. The last couple of weeks I have been busy improving the logging facilities of the Extension Manager, and since your case is in need of more logging information I would like to ask you if you want to test a development version that I now have. If you want to revert to the stable version later, you have to repeat the above steps but leave the #develop part of the npm install line out. If you now go to the %AppData%\RoonExtensions\log directory you should see three separate log files for the running extensions. After configuring the Denon and Harmony extension you can leave them running till the problem occurs. At occurrence you can zip up the log directory and drop me a link, then I will have a look. In case you run into an issue, let me know.